I'm off to Munich in a few days and I'll be staying for 3 days. I'd like to know what are the tools to find my best value options for airport-to-city, in-city and city-to-airport public transportation? Also, I need to have access to the internet, most of the time. I checked available free wifi hotspots but as it seems, they're not enough for the amount of moving which I've planned. I'd like to purchase a limited time (3 days) data sim card, so you won't miss me here in the SE. Are there such options available in Munich? And if yes, where can I purchase them? and what are the tools to find free wifi hotspots in Munich? 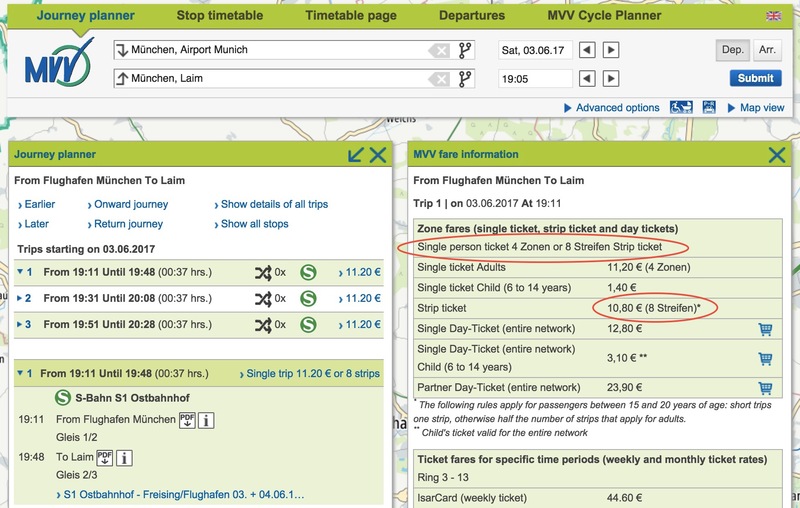 The MVV Journey Planner is your ultimate tool to find best-value options for public transportation in Munich. Through its app, I found out that MVV website has all that one need to compare best-value options for any type of trip. As the result of using that app, the best-value option I could find for my non-touristic 3-day trip was 2 single-day trip tickets within the entire network and one within the inner district. It can be selected to cover the "Entire Network", so you won't be needing extra tickets for your two trips from and to the airport which is located outside the "Inner District". It provides discounts for more than 70 tourist attractions in Munich and the surrounding area. The Stripe Ticket is better value for money than the Single Ticket. Depending on your destination, one or several of the ten stripes are validated. If you're planning more than 2 trips in the Munich city area, we recommend purchasing the Day Ticket for adults and children. For a definition of "Inner District", "Munich XXL", "Outer District" and "Entire Network" zones, see the MVV's Tariff maps. Using the MVV ticketshop website or its Android/iOS app you can purchase tickets in advance and pay with your credit card. Oh, I hate this third world 😤. The OnlineTicket is a ticket which is printed out on an A4 sheet of paper. You’ll have to carry it with you when traveling with the MVV and present it to ticket inspectors on request. You can purchase selected MVV tickets using the MVV-App on your smartphone. Register once and choose your ticket in the app before starting your journey. You can pay conveniently by credit card or by direct debit. The ticket is then automatically saved in you customer account and can be presented at any time – even if you don’t have an internet connection anymore. As electronic tickets are personalized, you have to bring your official photo ID. Munich's public transportation is built on a high level of trust. Ticket inspections are done on a random basis. If you get caught without a ticket or with an expired ticket, you can be fined up to €60. The fine will even follow you abroad! And the fear might never end. So, just pay the fare. Munich is a very bike-friendly city. You can rent bikes on local bike rentals like Mike's Bike Rental which also has expensive group bike tours, or go with the more widely-used one called Call-A-Bike. Its Android app has an English UI so you can use it without any language issues on a daily basis. But you need to go through the registration process once which is only available in German. This TripAdvisor article on Munich Public Transportation also worth a look. Also, check out the DB Navigator app if you need transportation information outside of the Munich city limits as well as the Google Trips which has a lot of terse and quick-to-access information on arrival and in-city public transportation. MVV's Journey Planner might come handy when you need to know how many zones a route pass through It's the ultimate tool for purchasing best-value transportation tickets, look no further. Lufthansa airport buses? are we insane? Want to see the whole Bavaria on the budget? Look for Bavaria tickets. Don't miss reading this one which goes through transportation types, signs and all the complementary information you need to not to get lost as a n00b tourist. The MVV is a bit of an umbrella organization. It doesn't operate any bits of the transit system, it just ensures a consistent schedule and fare system. It's like a cooperative of a bunch of transportation companies. One ticket allows you access to all participating providers. MVG and DB are the two primary providers. MVG is a daughter company of Stadtwerke München (which in turn is a daughter company of the city). DB is, well, DB. MVG runs the U-Bahns, Trams, and various buses. DB runs the S-Bahn. Several smaller companies run buses as well. And one MVV ticket lets you into the whole system. Munich has a good free wifi coverage, you just need to look for M-WLAN signs in the city, read more about them here. Also, you might want to consider installing some kinda "Offline Wifi Map" on your device, so you can connect to free wifi networks without the need to search for them. There are a lot of them out there, but I found that the community-driven Wifi Map is more useful than the others. Right now the easiest way to get a throwaway SIM is to go to a kiosk or very small store and look for Lebara and/or Lycamobile stickers on the door or windows. The SIMs are usually given for free, or for a very small fee, in which case they include credit. The store will often help with activating them. You can purchase credit in the same place. Usually in 5 Euro steps. You'll be given a receipt that has a number that you can use to text it to the top-up service. You can get 1GB for 9.90 EUR, for example. Not the answer you're looking for? Browse other questions tagged public-transport germany internet munich travel-tools or ask your own question. Where in Istanbul airport can I rent a portable 3G/LTE Wifi hotspot? Internet access at Dubai airport? How can I rent a mobile WiFi hotspot during my five-week trip to the UK? Public shower options in Munich? Can I still purchase 4G/unlimited SIM card once I leave the airport in South Korea? Is it currently possible for a foreign traveler to buy and use a prepaid SIM card in Argentina?